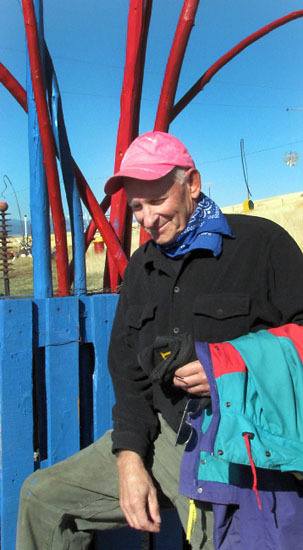 Rhys Court stands next to one of the brightly colored sculptures from his current phase of work. 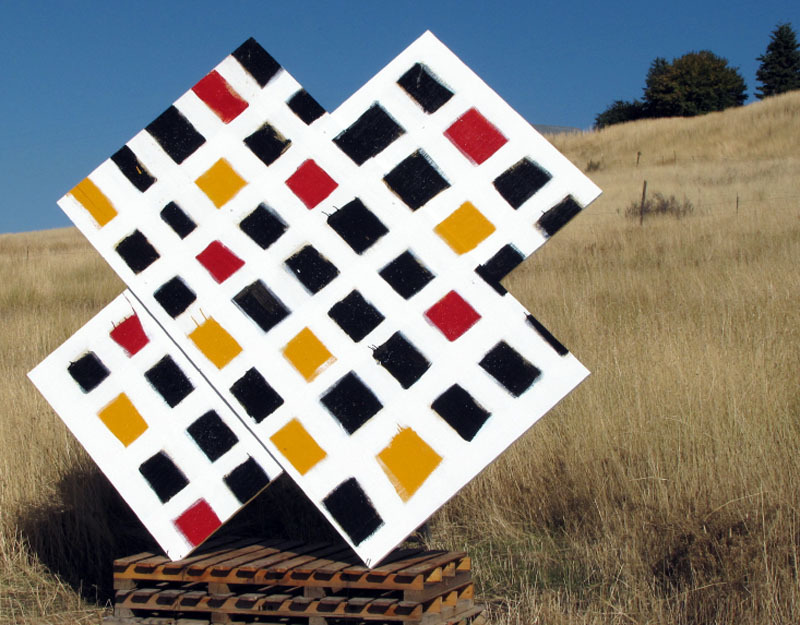 Anyone who's ever been on Bear Creek Road above the golf course has seen Rhys (pronounced "reece") Court's art and, in recent months, witnessed a creative explosion that leads the artist himself to call this a great and "really productive year." By November, when his outdoor work season ends, 15 or 20 new pieces will be on display in what has become a two-acre outdoor gallery. 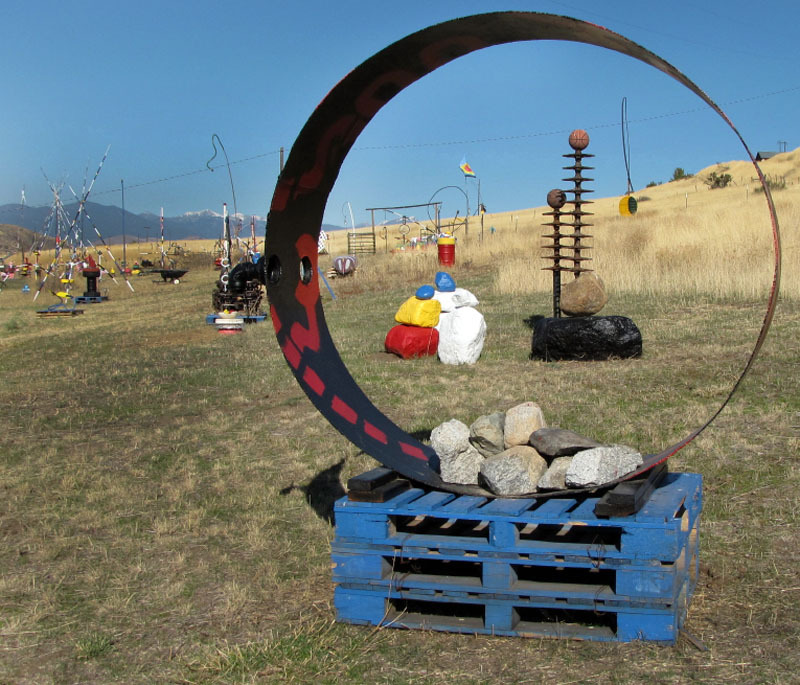 Some works are organized as installations with numerous pieces that can stand alone but also "talk to one another," as in the new grouping at the southeast corner adjacent to the road that's all circles and curves in bright blue and red and shiny black. "I've been doing art my whole life," says Court, who grew up in the valley. As with most people who have reached their seventh decade, his life experience is interesting and varied. But with just one hour set aside for a personal tour, art was the only subject of conversation. 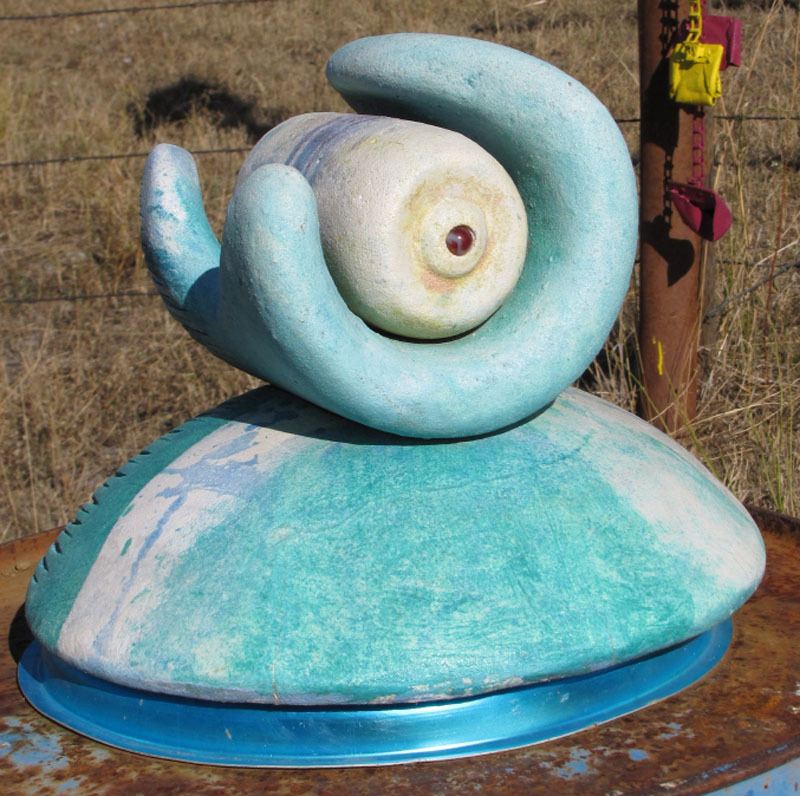 Court started creating outdoor sculpture just eight years ago. 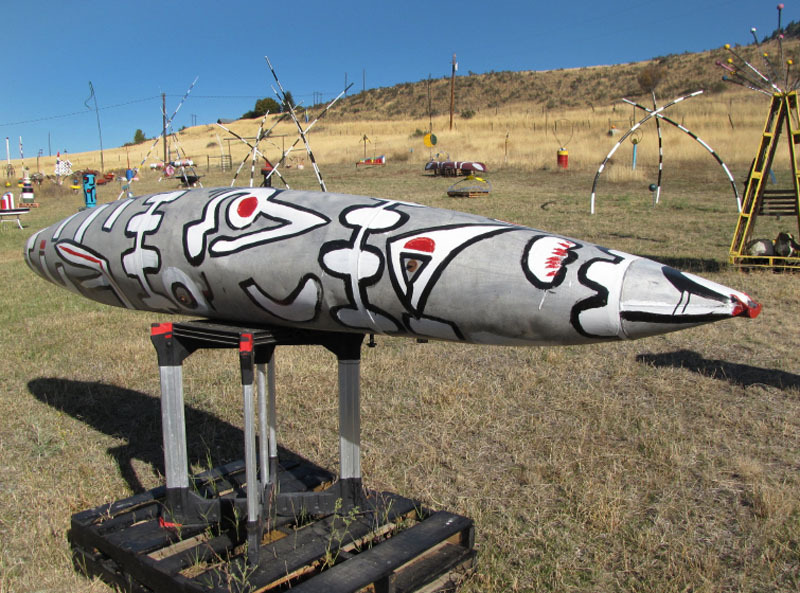 His first piece was the 45-foot-tall teepee made with painted poles recycled from previous use as flag poles. (He makes all the flags flying on his place.) 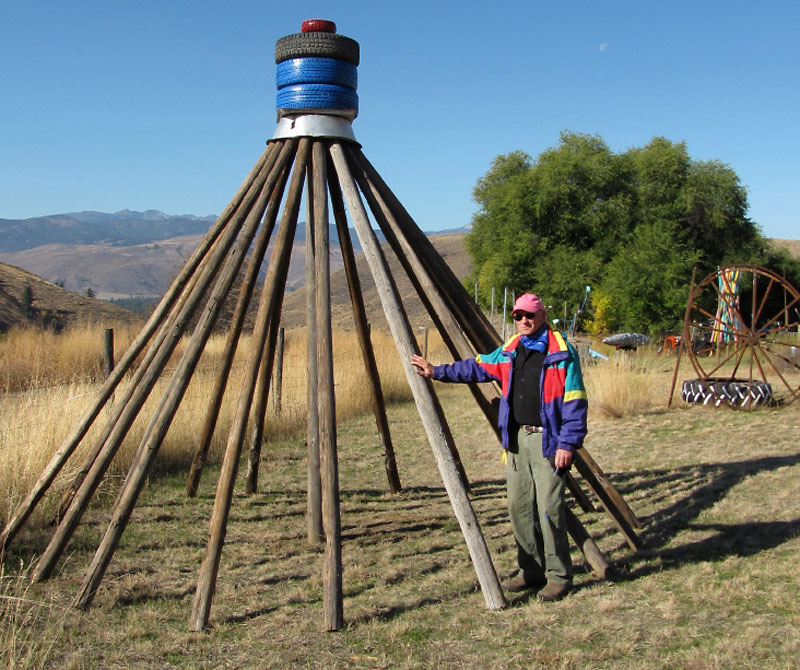 With poles ranging in length from 32-to-45 feet, the teepee was a two-person engineering project. 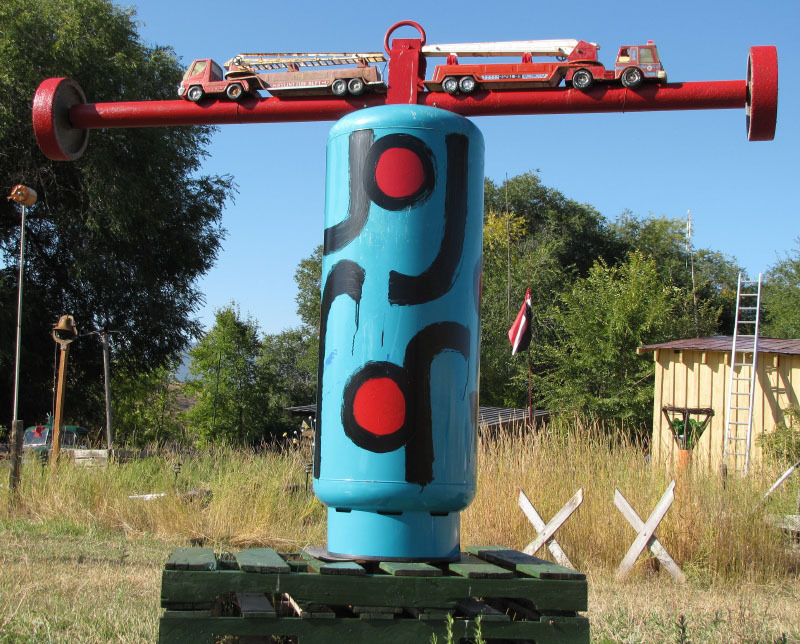 Many of his works, at least one of which weighs about 500 pounds, require an assistant and block and tackle to put in place. But the challenge of how to erect the art is part of the creative process, and Court has strict standards. 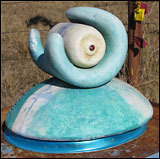 For example, to succeed in his eyes each creation must be anchored to withstand wind gusts up to 60 miles per hour. The paint - he often uses marine-grade, oil-based paint - has to endure exposure to extreme hot and cold and plenty of snow. Thus the platforms on which the sculptures are displayed are integral to the completed piece. "Will it tip over? Will it shatter if it does?" These are essential questions he asks. "I have 200 sculptures now," he says. They represent all phases of his work from the cement creations of a few years back to the found objects of 2009-2010 to his current period using mostly wood and steel, often with paintings on the surface. That's because after years of working as a painter on a two-dimensional surface, and wanting to make paint work on a three-dimensional form, he has solved the problem to his own satisfaction. Reclusive by choice, he is working at least four hours a day when a concept is developing and, if it's going well, eight hours. "I suit up and show up," he says. When winter forces him indoors, Court will re-enter his two-dimensional world of drawing and painting, which he has been doing seriously since his early 20s. He works in pen and ink and acrylics. He has a Bachelor of Arts degree in Fine Art from Central Washington University and did graduate work at the University of Idaho, Montana State University and the University of Oregon, where he studied cinematography. "I started in photography," he said. He once worked with 16 millimeter film. 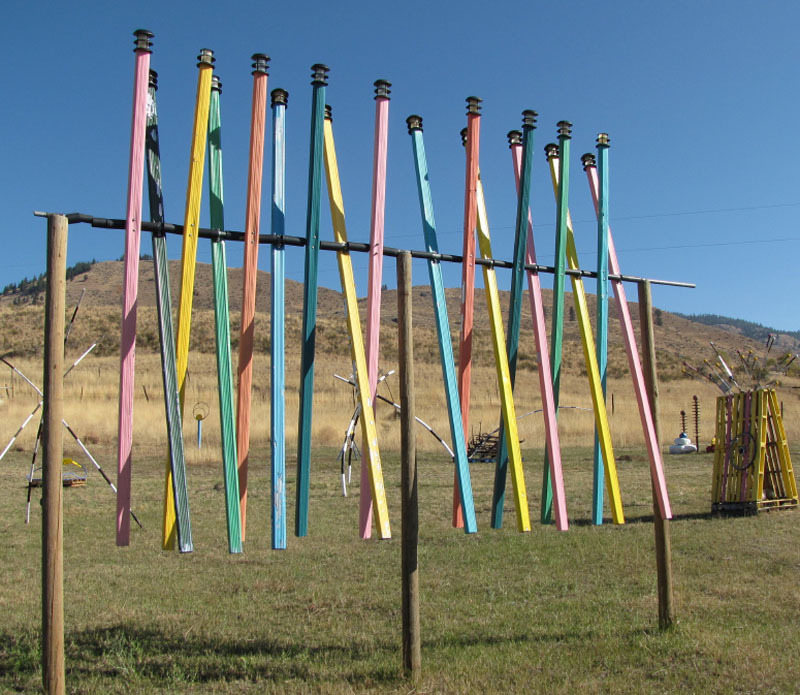 Court taught art for many years, and still teaches occasional classes, including at the Confluence Gallery in Twisp, where he has had a few of his pieces on display. 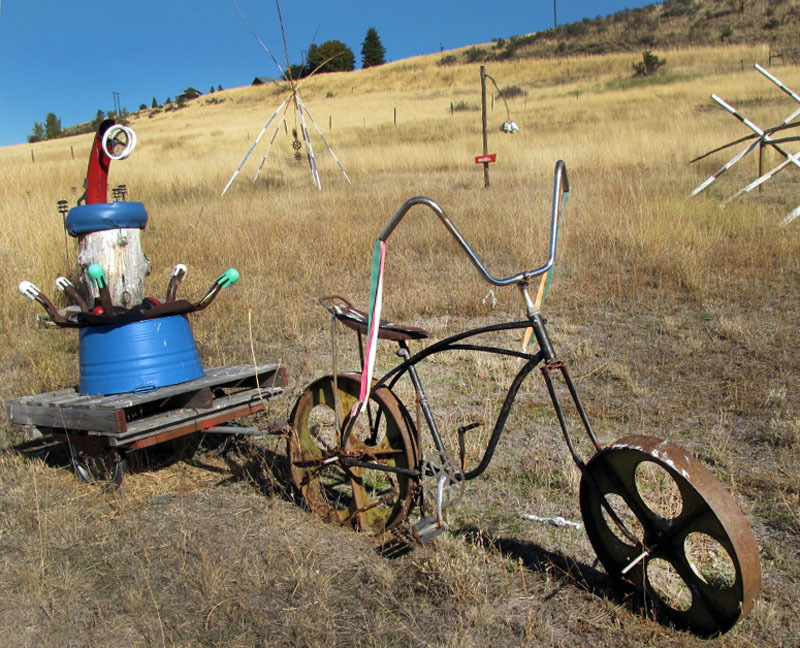 Beyond the Methow Valley he has shown his work at the Henry Gallery in Seattle, the Breadline Cafe in Omak, the Cheney Cowles Museum in Spokane and at a one-man show at Gallery 76 in Wenatchee, to name a few. But standing on his own home turf on a gorgeous fall day, Court looks over his hillside and says, "This is the gallery. I'm grounded here and happily so."